I always have gripes about the Marvel Avengers Alliance game. Don’t you? But I have to say I liked how several heroes came out at the same time with Spec Ops, Chapter 9 and the DeadPool PVP tournament. It caused much confusion. We all had to make choices – often without much support from the scholars and scribes. Q: How cool is DeadPool? A: DeadPool comes with a 24 ounce squeeze-bottle of awesome sauce. Bugs… I mean – features! No one knows where DeadPool put the Red Boxes. And he’s just totally broken. Most of the time, DeadPool is too busy giving +1s to everyone. Is Deadpool on Google’s payroll?! Playdom has a month to fix him. Right? 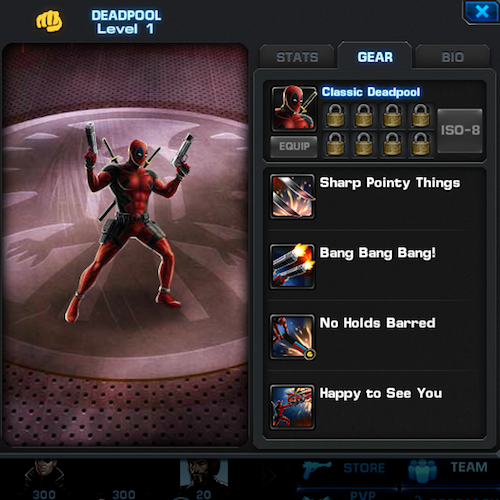 Is DeadPool worth 90 CP? But even when he’s totally broken, nerfed, and killing time on the internets, DeadPool still rocks. He lays the hurt out like he was giving away candy. Deadpool is worth 90 CP. Perhaps – for the parody alone! He illuminates the ironic that truly gives this hero a personality – unlike all the other heroes. Yes, Playdom needs to work on that. But can he PVP?! We’ll see soon enough. Q: Is the Beast any good? A: Did James Joyce have epiphanies?! No bugs were noticed, but the jury is still deliberating. Is Beast worth 90 CP? 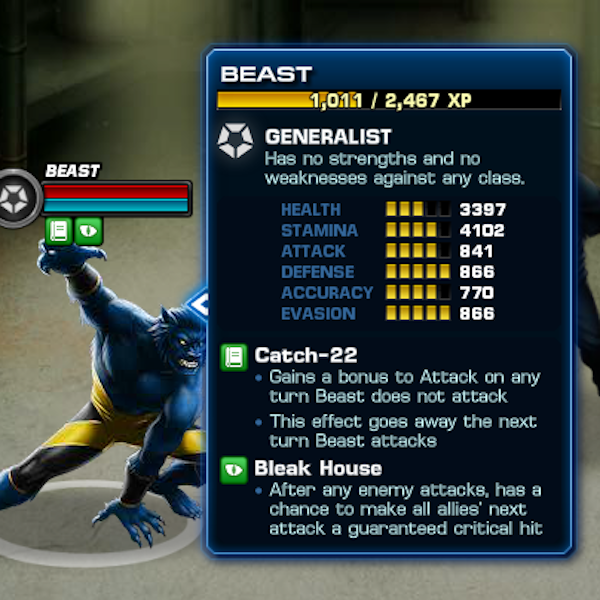 Beast is worth 90 CP if he gets a uniform that gives him Resistance to Psychic Attacks, Haste (two turns) and Epiphany for the first three rounds. Because while his buffs are worthwhile, he doesn’t do much damage. The allusions to great books are wonderful! Unfortunately, no one at Playdom actually read great books and therefore they lacked the ability to actually include provocative quotations. At this moment, Beast is not recommended for PVP. Q: Can you kill the Ghost Rider? A: If you go the extra mile. Oh – you got to wait for that fourth or fifth round when Ghost Rider has laid all seven deadly sins on a target. Is Ghost Rider worth 90 CP? 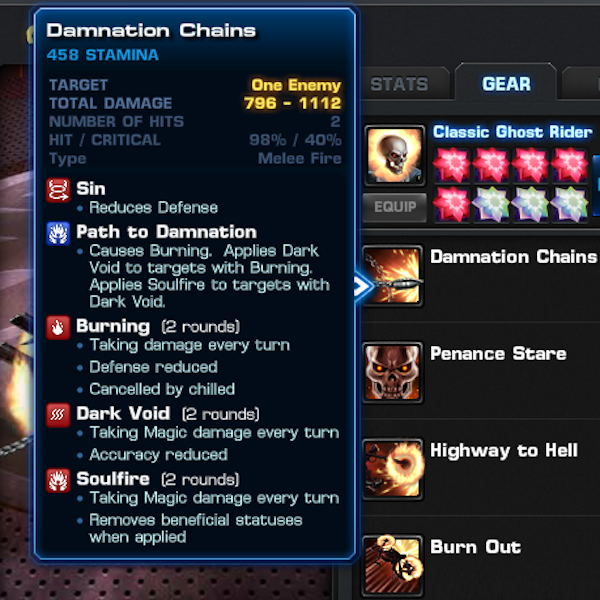 Ghost Rider is worth 90 CP if his Infernal Contract is renegotiated. 1. GR is currently immune to Burning – he should also take half damage from any fire-based attack or DOT. 2. Attacks that would reduce GR’s health to 0 should have a 70 percent chance to reduce him to 1 percent instead. 3. All the other things about the contract can stand. At this moment, Ghost Rider is not recommended for PVP. I lost 300 rank points in the Deadpool Tournament – in less than two hours due to Ghost Rider’s stand up performance. Please share the link to The Hero School Review on Facebook, Twitter, Google Plus, etc. Unintended glitches happen and may make gear better (or worse) than intended by Playdom-Disney. If you discover an uber exploit that will make us all think twice about a seemingly unwise purchase, please let us know in the comments. Play Marvel Avengers on Playdom.com with more energy, more UISOs and a lot more RAH! If you want your Marvel Avengers Alliance FB group, forum or website added to this list, let’s arrange a walk through. 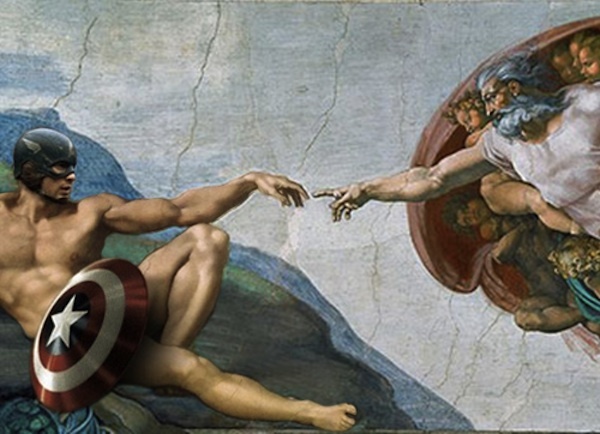 This entry was posted on Friday, November 9th, 2012 at 5:55 pm and is filed under Games. You can follow any responses to this entry through the RSS 2.0 feed. You can leave a response, or trackback from your own site.